This eBook edition of "The House of the Seven Gables (Illustrated)" has been formatted to the highest digital standards and adjusted for readability on all devices. 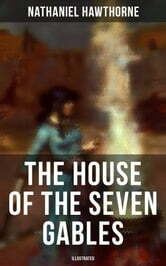 The House of the Seven Gables is a Gothic novel which follows the story of a New England family and their ancestral home. In this book, Hawthorne explores themes of guilt, retribution, and atonement and colors the tale with suggestions of the supernatural and witchcraft. The setting for the book was inspired by a gabled house in Salem belonging to Hawthorne's cousin Susanna Ingersoll and by ancestors of Hawthorne who had played a part in the Salem Witch Trials of 1692. American novelist and short story writer Nathaniel Hawthorne's (1804-1864) writing centers on New England, many works featuring moral allegories with a Puritan inspiration. His fiction works are considered to be part of the Dark romanticism. His themes often centre on the inherent evil and sin of humanity, and his works often have moral messages and deep psychological complexity.